This extremely handsome dish belongs to a group of wares that are now internationally admired, but which, when they were first made, seem to have been held in higher regard in countries to the West of China than within its own borders. Large 14th century dishes, both blue and white and Longquan celadon, were particularly valued in the Islamic West, where they were used for princely banquets. A detail of an illustration from a Mughal Babarnama (memoirs of Babar) manuscript, dated c. AD 1590, in the collection of the British Library, shows such large dishes being used at a feast. Each of the large dishes has a cover (possibly rattan) over it to keep the food hot and clean, illustrated by Ellen Smart in 'Fourteenth Century Chinese Porcelain from a Tughlaq Palace in Delhi', Transactions of the Oriental Ceramic Society, vol. 41, 1975-77, pp. 208-9, plate 69 (fig. 1). Several other early illustrations show these large Chinese dishes being used at royal banquets, where their enormous capacity would have been particularly useful for the Islamic tradition of large communal food dishes. Three collections containing significant numbers of these large dishes emphasise the esteem in which Yuan dynasty porcelains were held in South and Western Asia. These are the collections of the Topkapi Saray, Istanbul, the porcelains from the Ardebil Shrine, now housed in the Iran Bastan in Tehran, and the Chinese porcelains found in the ruins of the Kotla Firuzshah, a Tughlaq Palace in Delhi. Among the dishes preserved in Istanbul is one (d: 48cm.) with a mandarin fish among aquatic plants in the centre, lotus scroll in the cavetto and lattice on the flattened rim, illustrated by J. Ayers and R. Krahl in Chinese Ceramics in the Topkapi Saray Museum Istanbul, vol. II, Philip Wilson, London, 1986, no. 568, p. 495 and colour plate on p. 403. Two Yuan fish dishes are published from the Ardebil collection. One is very similar to the mandarin fish dish in Istanbul, although a little smaller at d: 41 cm., illustrated by John A. Pope, Chinese Porcelains from the Ardebil Shrine, Philip Wilson, London, 1981, plate 9. On the second Ardebil fish dish (d: 45.5 cm. ), the fish and aquatic plants are much less well painted than on the mandarin fish dishes, and the fish depicted is less easy to identify, although it may represent a silver carp. 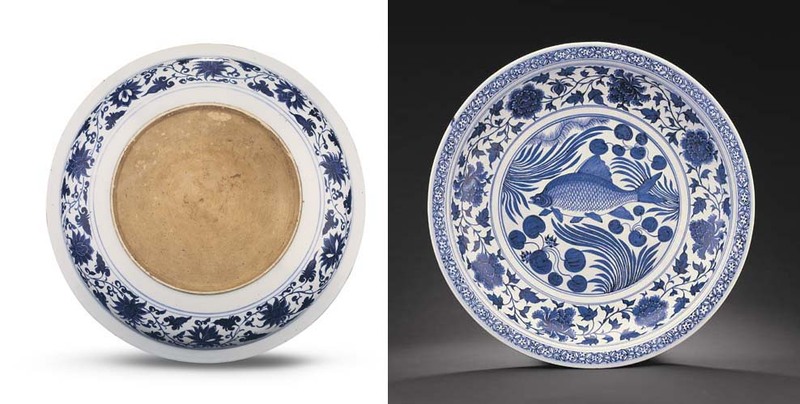 The proportion of the surviving Yuan blue and white dishes which have fish as their central decoration is highest at the Delhi site. Among the relatively small number of dishes illustrated by Smart in her article on the Kotla Firuzshah, six are decorated with central designs of fish among aquatic plants, see E. Smart in 'Fourteenth Century Chinese Porcelain from a Tughlaq Palace in Delhi', op. cit., plates 78 b and c, 79 b, 80 a, 81 a and 90 a. It is also interesting to note that, although the majority of surviving Yuan blue and white dishes with fish decoration elsewhere depict mandarin fish, only one of the Delhi dishes (shown in Smart's plate 79b) appears to show this type of fish. All the others depict carp - some appear to be black carp (mylopharyngodon piceus), while others seem to be silver carp (hypopthalmichhys molitrix). The Delhi site also provides a more precise dating for the pieces found there than either the Istanbul or Ardebil collections. The Kotla Firuzshah is a palace complex that was built on the west bank of the Jamna river in AD 1354 for Sultan Firuzshah Tughlaq. After Firuzshah's death in 1388 the palace was largely abandoned, and it was eventually destroyed by Timur in 1398. Thus, any porcelain found at the site was almost certain brought to the palace between 1354 and 1388. This dating fits well with the date of the blue and white porcelains. Inscriptions drilled through the glazes of the Kotla Firuzshah porcelains also confirm that they were from the royal kitchens. As noted above, the majority of the Yuan blue and white large fish dishes depict Chinese perch or mandarin fish (siniperca chuatsi). A dish (D: 47 cm.) formerly in the collection of Mrs. Walter Sedwick, and now housed in the British Museum has such a mandarin fish in its central roundel. This dish, which has a bracket-lobed rim, has a lotus scroll in the cavetto and a lattice band around the flattened rim. A Yuan blue and white dish (d: 46.1 cm.) in the Idemitsu Museum in Tokyo, also has a mandarin fish amongst aquatic plants in its central roundel, a lotus scroll in the cavetto, and a lattice band around the flattened rim, which is not lobed. Cf. an illustration in Chinese Ceramics in the Idemitsu Collection, Tokyo, 1987, colour plate 144. A very similar dish with mandarin fish and the same minor bands (d: 45.7 cm.) is in the collection of the Metropolitan Museum of Art, New York, illustrated by S. Valenstein, A Handbook of Chinese Ceramics, Metropolitan Museum, New York, revised edition 1989, colour plate 18. The Freer Gallery also has a dish (d: 45.5 cm.) with mandarin fish, a lotus scroll in the cavetto and, in its case, a concentric arc wave band on the unlobed rim. A fish dish with bracket lobed rim and unusually crowded design (d: 46.5 cm. ), which was in the Reitlinger collection, is now in the Ashmolean Museum, Oxford. This dish, which has a reserved peony design in the cavetto and a so-called 'blackberry lily' scroll on the rim, appears to depict a predatory carp (culter erthropterus) in the central roundel; illustrated in Eastern Ceramics and other works of art from the collection of Gerald Reitlinger, Ashmolean Museum, Oxford, 1981, p. 21, no. 2. A Yuan dynasty blue and white dish (d: 45 cm.) with two different fish depicted in the central roundel is in the collection of the Hunan Provincial Museum, see Zhongguo wenwu jinghua dachuan - Taoci juan, Taipei, 1993, p. 338, no. 570. This dish appears to depict a mandarin fish with a predatory carp. The cavetto of the dish has a peony scroll and the flattened rim has a wave band. Another dish in the Matsuoka Museum of Art (d: 40.8 cm. ), also has two fish in the central roundel, but in this case they appear to be two silver carp. The pair of fish depicted in the centre of a dish in the Hunan Provincial Museum (d: 45.3 cm.) are less easy to identify, and may have simply been intended to be a more general representation of carp, cf. T. Mikami, Sekai toji zenshu - 13 - Liao Jin Yuan, Shogakukan, Tokyo, 1981, pl. 219. The carp on the current dish is particularly well-painted, and closely resembles the fish painted on two Yuan dynasty blue and white fish jars. One of these is in the collection of the Brooklyn Museum of Art, illustrated by Christie's London, Chinese Ceramics and Works of Art including Export Art, 11 July 2006, p. 112, fig. 4. The other jar with a very similar fish was included in the Eskenazi catalogue Two rare Chinese porcelain fish jars of the 14th and 16th centuries, London, November 2002, p. 20, lower image. Both of these jars depict fish with the same swelling body as that on the current dish. Fish dishes like the current example are among the most impressive of Yuan dynasty blue and white porcelains. Other Yuan kilns adopted similar themes - as can be seen from a dish from the Duandian kiln site at Lushan, which was excavated in 1990, illustrated in Ceramic Finds from Henan, University Museum and Art Gallery, University of Hong Kong, 1997, p. 115, no. 86. The theme of fish among aquatic plants was also continued into the Yongle reign of the Ming dynasty (AD 1403-24) but by that time the design had become purely decorative, see R. Fujioka and G. Hasebe, Sekai toji zenshu - 14 - Ming, Shogakukan, Tokyo, 1976, p. 175, pl. 179. The powerful painting seen on the current dish was never equalled.